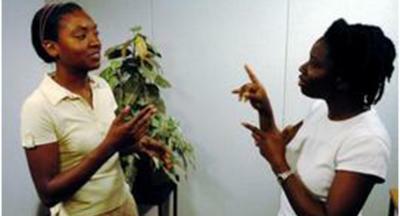 The National Registers of Communication Professionals working with Deaf and Deafblind People (NRCPD), the UK’s registration body for sign language interpreting, reviewed the programme earlier this year. Following their visit, they have now approved the BA (Hons) Interpreting: British Sign Language/English degree with the highest possible level of accreditation. It is the first BA route in the UK to achieve this endorsement. Graduates with a First Class honours degree from the Programme will be able to register as full Members of the Register of Sign Language Interpreters with the NRCPD. This means they can start their professional working life as a Registered Sign Language Interpreter anywhere in the UK, without the need to obtain further qualifications. Sarah Bown, Head of Interpreting, said: "We are delighted that the interpreting degree has been given this level of recognition. The enhanced level of professional accreditation is testament to the consistently applied high quality standards delivered by the teaching team, and the abilities of our graduates. We are the longest standing sign language interpreter training programme in the UK and the only Bachelor of Arts route to achieve this endorsement." Kristiaan Dekesel, Head of Undergraduate Recruitment for the Faculty of Social Sciences and Principal lecturer within Deaf Studies and Interpreting, said: "To date, our students have achieved high levels of employability success. They are engaged across a range of sectors in the UK and indeed across the globe, in settings such as Television, Legal, Medical, Social Services, Education and Training to name but a few. “In fact, anywhere there is a Deaf person requiring access, whose first or preferred language is British Sign Language, our interpreting graduates will have the potential to make a positive impact on their lives." The University launched the Interpreting programme in 1993 as part of its wider mission to broaden opportunities for Deaf people by facilitating Deaf people’s access to Higher Education and raising Deaf awareness within all areas of society and work. For media inquiries please contact Emma Pugh on 01902 322736.